It’s true. The shallow shoreline waters just off Sandbridge Beach literally teem with dolphins, especially when the weather is warmer. Visit the shore at sunrise or sunset for your best chance to spot these beloved marine mammals as they leap and frisk in the waves. More than 30 kinds of dolphin inhabit the Atlantic Ocean just off southern Virginia. Spotted and white-sided dolphins sometimes appear close to shore. But the best-known species is the Atlantic bottlenose… and that’s the kind you’re likeliest to see at secluded Sandbridge Beach. Famous for their winsome “smiles,” these friendly, intelligent creatures prefer warmer coastal waters where they can feed on plentiful fish. As temperatures dip, they’ll migrate south – to North Carolina and even farther. That’s why warm months make the perfect time for dolphin watching at Sandbridge. Fortunately, they are also ideal for a seaside family vacation! You’ll easily recognize a bottlenose. It’s relatively large – eight to 12 feet long in adulthood – with a gray back, whitish belly, and eyes set wide apart, one on each side of its head. Its distinctive snout is long and round, while its dorsal fin (on the middle of its back) is curved, not straight like a shark’s. It uses its two front flippers to steer and its two back flukes (i.e., tail) for swimming. It breathes through a single blowhole, and it catches its food by grasping it between two sets of small, sharp teeth. A typical bottlenose male can weigh up to 1,100 pounds. Yet despite this girth, these muscular animals are amazingly agile. You’ll see them jumping up to 20 feet in the air, blowing bubbles, smacking the water surface, and even butting heads. Dolphin watching is easy. No need for any fancy equipment or elaborate preparations. 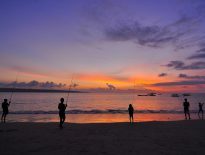 Simply stroll along the beach at dawn or dusk. Or stake out a spot on the Little Island Pier. Dolphin sightings aren’t guaranteed, but they’re extremely common. If you’re at the shore at feeding time, you’re fairly sure to see a few bottlenose. Don’t be disappointed if they don’t show up your first time. Just come back the next day… or the next. Like all dolphins, bottlenose are social animals. While a few may swim alone, most swim in groups of up to 12 or more, known as pods or schools. Some pods can number as high as 25. So, if you spot one bottlenose, you’ll soon see others as well. Want to come just a little closer to these amazing creatures? Venture out beyond the shore in a boat or kayak during peak sighting hours. Dolphins love boats – and people! – so you may find yourself surrounded by a welcoming pod. Don’t be afraid; these affectionate mammals truly mean no harm. Chances are they’ll swim alongside your craft or perhaps cruise in its wake. Do you surf? You may encounter a pod of dolphins as you ride the waves. Like human surfers, bottlenose love to catch incoming waves as they crest and pound the shore. You could find yourself surfing side by side with a few frolicking companions. Prefer an easier way to meet and greet Sandbridge dolphins? Try stand-up paddleboarding, preferably when the surf is not too high. Who knows? You just might paddle your way into the midst of a playful pod. Resist the urge to pet your new friends, however. Dolphins have very sensitive skin, easily damaged by human contact. Plus, if you’re alone, you could put yourself at risk. Remember, these animals are a lot bigger than you are! How would you like to watch dolphins splash and play as you relax in a luxurious cruise boat, with wraparound windows for thrilling 360-degree views? Several companies in nearby Virginia Beach offer this kind of experience. One of those companies, Rudee Tours, even guarantees dolphin sightings: If you don’t spot at least one dolphin during your 90-minute excursion, your next trip is totally free. 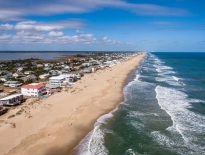 Rudee Tours operates out of Rudee Inlet, about 15 miles north of Sandbridge Beach. Its two-level, 65-foot-long boat, the Rudee Flipper, provides amenities galore, including spacious, comfortable seating and delicious food and drink. Veteran staffers are on hand to regale you with fascinating dolphin lore. What better way to enjoy a leisurely sighting? 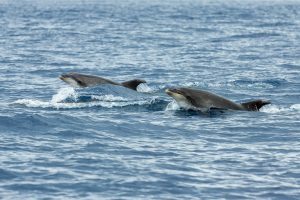 There are few things more thrilling than a dolphin sighting, when the bottlenose are leaping and soaring, with the setting sun glinting on their sleek, silvery backs. Why not treat your family to this unforgettable experience?